This ginger turmeric fried rice bowl is a comforting winter meal, with its rich and earthy flavours. A healthy rice bowl that’s easy to prepare and loaded with anti-inflammatory ingredients. Healthy rice bowls are my favourite comfort food, and this recipe is a super healthy variation of traditional fried rice. Large batches of rice and legumes make up some of my Sunday meal prep for the week, which makes this quick healthy meal a cinch to prepare on a busy weeknight. I was inspired to create this healthy rice dish the other night for two reasons – I had a ton of leftover rice in the fridge, and also because I wasn’t feeling very well. Muscle aches, lethargy, and zero energy. Coincidentally, I had recently purchased some fresh ginger and turmeric root – which are both known to have anti-inflammatory and antioxidant properties. Developing this healthy rice bowl wasn’t rocket science, since I had all the ingredients at my fingertips. 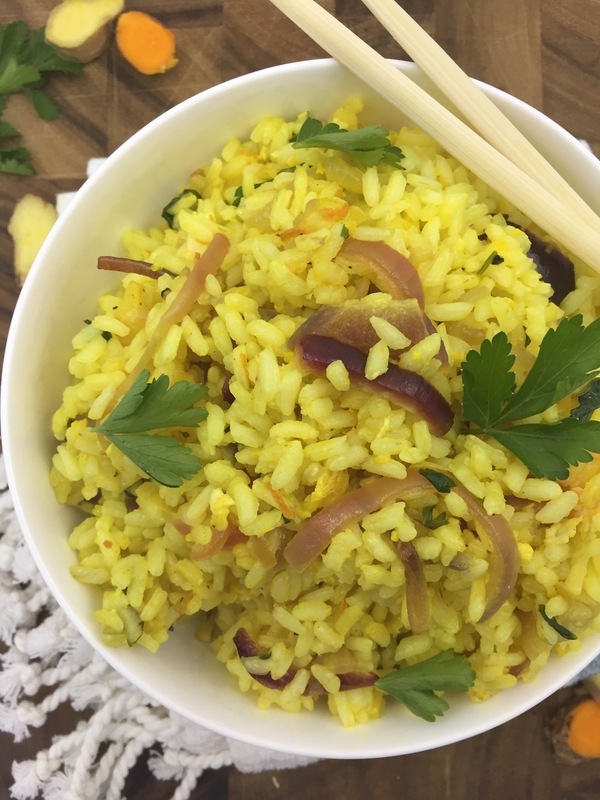 This ginger turmeric fried rice bowl might be easy to prepare, but it is packed with flavour and healthy ingredients. Sesame oil gives a rich nutty flavour and the caramelized onions adds a touch of sweetness. 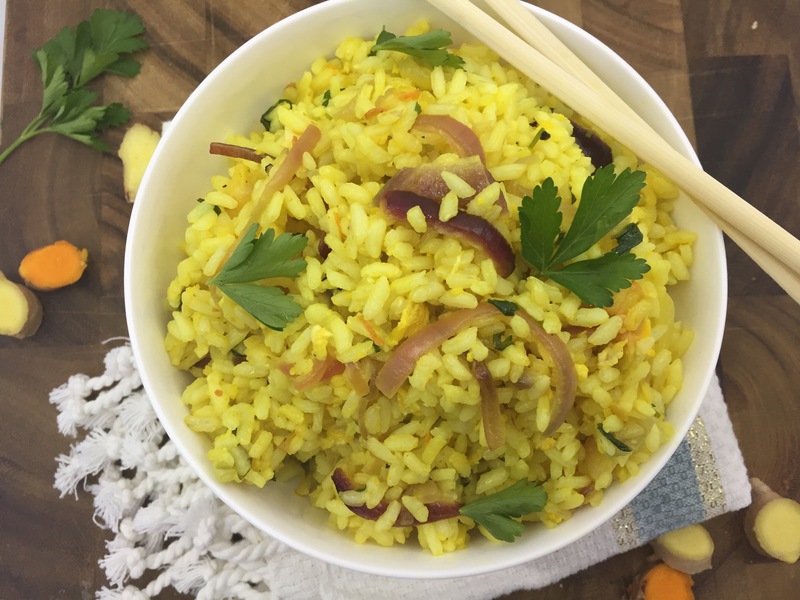 The ginger adds a hint of spice, and as for the turmeric, it transforms this rice into a beautiful deep yellow hue. This recipe is designed to be a blank canvas that you can get creative with, so have fun and experiment. The simple flavours in this ginger and turmeric fried rice bowl make it delicious as is, but there is always room for interpretation. 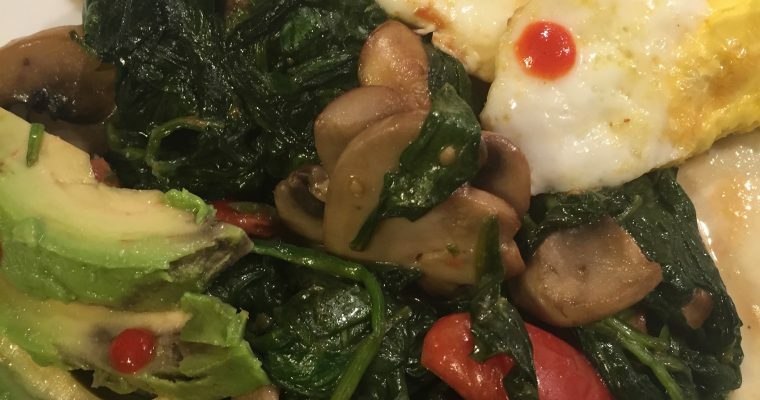 Which other ingredients would you add to this healthy rice bowl? In a large frying pan, heat the olive oil and sesame oil on medium heat for 1-2 minutes. Add the garlic, onions, ginger, and turmeric and sauté for 5-7 minutes or until the onions are translucent. Once cooked, add the rice and continue to sauté for another 4-5 minutes or until the rice is heated through. If adding eggs, push the rice to the sides of the frying pan, leaving a small empty circle in the middle. Add the eggs and cook for 1-2 minutes, then mix into the rice and cook for another minute until they are completely scrambled and cooked through. Garnish with some freshly chopped parsley or cilantro. 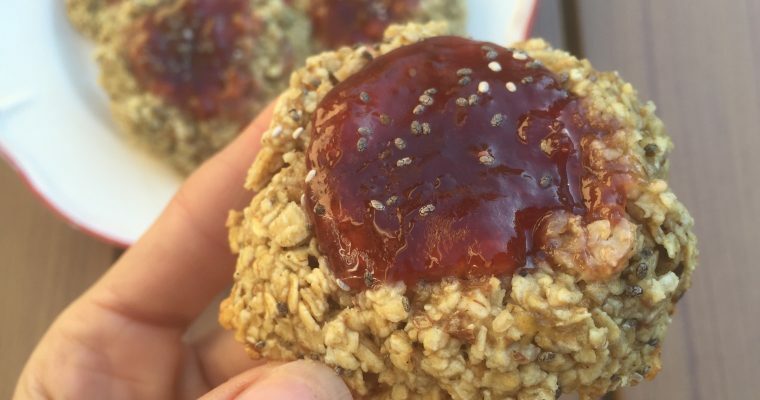 If desired, add some superfood like sesame seeds, hemp hearts, or chia seeds as a crunchy garnish. Store in the fridge and consume within 4 days of preparation. I made this just today! It was absolutely delicious and I must admit I mad some changes to the recipe. I did not have much rice left because it’s something I eat often so I cooked just one cup of rice. I used about a third of a yellow onion and I could not find a good grater to use in my house,so I finely chopped my fresh ginger, garlic, and tumeric (about 1/2 tbsp). I used a bit more tumeric then ginger because I wanted to have the ginger be more of an undertone in the dish and bring out the tumeric and garlic more. I did not have sesame oil so I used a bit more olive oil and sautéed all the spices and onions for a while longer then recipe asks. It brought out the flavors a bit more. When I added in the rice to simmer I added bit more lemon juice then the recipe asked. And finally I sprinkled some salt and pepper on it all. To top off the whole dish I added some freshly cooked black beans to add some fiber and protein, I must say adding the beans was a good addition. It added a bit of heartiness. I’m also glad that I used a smaller amount of rice, but still used a good amount of spices. I feel if I had followed the recipe it would have turned out a bit dry. I love the combination of spices however. The tumeric is very earthy and made the rice vibrant while the ginger and garlic livened up the taste. My sister and I enjoyed this, and it’s the kind of cooking I enjoy so I had a blast! This looks delicious!! I love soups and rice dishes when it’s super cold out – and that it is here!! I definitely want to try this out! It sounds like an awesome recipe! It’s freezing here now and I’ve been down sick all week. I would love a big bowl of rice. This looks so good right now. I’ve never really cooked with ginger or tumeric before but I do eat a lot of rice so this is something I definitely need to try. I would probably add egg or chicken, maybe some broccoli to this. Oh yummy…anything with ginger is a-okay by me! I love that nice bit of spice and light heat it can add to a dish. I don’t often cook with turmeric, but it does have such a lovely flavor, too…it sounds so wonderful paired with the ginger and other ingredients in this dish! Thanks so much for sharing. I very rarely cook with turmeric, I guess it is the forgotten spice in my home. I’ve read a lot about it’s health benefits and have wanted to venture out, but I guess I fall back into my normal routine. This rice dish looks so flavorful and delicious! This looks delicious and so easy to make. I like the idea of adding turmeric to fried rice. With all the extra health benefits of turmeric there’s no reason not to add it to everything. I love getting fried rice from the Chinese takeout place. I haven’t tried making a fried rice bowl at home yet but I think this would be a perfect weekday meal. I would definitely love to try this. My whole family would enjoy this dish! I have always wondered how to cook with turmeric. It is a big trend right now in my area to use it for health purposes, so I wasn’t sure just what to do with it! This looks great. I have heard so many good things about Tumeric so this would be a great way to use it in a nice dinner dish. Sounds so yummy and pretty easy to make too. That looks so good! I love the warmth and flavor of ginger and tumeric, ESPECIALLY living up here in Canada. This is the kind of dish that I can serve as-is or add in some meat to serve a nice warm meal on a cold Canadian winter day. I love rice dishes! Rice is a great way to make food filling, stretch a budget and not to mention, not too bad for you! I love adding fresh veggies to my rice. Things like carrot, broccoli and snap peas are some of my favorites! I spent a lot of time outdoors this weekend kayaking. I’m feeling it today and could really use some comfort food but don’t want to blow my diet. This recipe looks delicious. I like ginger and turmeric. Both ingredients are good for inflammation and I imagine it tastes like Indian food. I will have to try this one for sure. Turmeric is healthy but recipes including it are not very familiar to me. We just have the turmeric powder and sometimes we put to water to make it juice. This rice bowl looks tasty but I would rather eat it with eggs on the side.